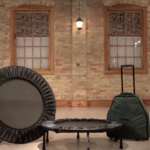 Why choose the Cellerciser Half Fold Rebounder? There are lots of rebounders to compare. The Cellerciser has a few advantages over the Bellicon and JumpSport brands. Either way you choose, these three brands: Cellerciser, Bellicon, and JumpSport are the top picks. First off, the quality of Cellerciser is top notch, but above and beyond the quality, there’s also the convenience. The Cellerciser Half Fold…folds in half! It’s convenient for storage. We personally own a JumpSport, but one of the drawbacks is that it doesn’t store well. It can be stored vertically, but the feet take up a lot of room. The Half Fold by Cellerciser can fold up and be stored under a bed, or in a closet when you’re done using it. It’s quite tempting if you don’t want to store it out all the time. Being able to fold it up can also make it easier if you’re wanting to take it to the living room to jump while you watch TV, then fold it up and take it to it’s regular storage location. Carrying other rebounders up and down the stairs might be good exercise, but a little unwieldy trying to navigate around the legs. So the folding Cellercise makes a lot of sense in that regard. Pronation can be an issue with any rebounder. You don’t want the mat too be so stretchy that it causes your ankles and feet to bend in while you jump. That’s just asking for injury there. The other top brands, JumpSport and Bellicon have great mats on their rebounders, but if you’re looking for something very firm, the Cellerciser is a great choice. Now, a JumpSport and Bellicon can be adjusted to the firmness you desire, but the Cellerciser offers great firmness and because of the tiered spring system, it “adjusts” to your weight to offer great support. With a great rebounder, you’re going to gain some fantastic health benefits. To gain results you’ve always wanted, you’ve got to exercise your whole body, but an elliptical, row machine, cycler, or treadmill just won’t do it. They exerciser only specific groups of muscles. Cellercise is the ultimate exercise as it flexes ALL 75 TRILLION CELLS at the same time! Even better, it requires only 10 minutes a day! More on the Cellerciser Benefits. What happens when you jump using a rebounder is that it increases gravitational force on all the cells in your body at the bottom of a jump. At the top of a jump, all that force is released. You’re getting an up and down tension and release not just of your muscles, but of all the cells in your body. Here’s one of my favorite vids that show some amazing benefits of the Cellerciser. It’s a test to see strength and balance before using and after using a Cellerciser for the first time. Pretty awesome. 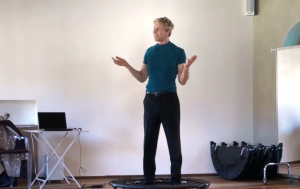 It’s an exercise for the whole body, not just a part of it, and you can get a really good workout on a rebounder in just 10 minutes. What does the Half Fold Cellerciser Include, and should you get the Tri-fold? The Tri-Fold is a more expensive model of the Cellerciser that folds smaller than the Half Fold. If you really want to not leave your Cellerciser home when you travel, the Tri-Fold is a great option. It’s made to the same standards as all Cellerciser equipment, it just folds smaller and has wheels on the bottom of it’s case (vs. the carry bag of the Half Fold Cellerciser). The drawback of the Tri-fold is that it’s 1.5 times more expensive than the Half Fold. But, if portability is what you need, you can check out the Tri-fold on Amazon. The Half Fold however fits that perfect sweet spot – portability and price. I was reluctant to spend this much money on exercise equipment, but this is worth every cent. I have been using this for just under two weeks and already notice a difference in my muscle tone, energy, and overall well-being. my previous rebounder was a cheapie Walmart springed contraption that could barely be called a “bouncer”. in contrast this thing is like a cadillac. I never feel like I’m bottoming out or jarring myself at the bottom of the bounce. The reviews come in at 4.5 out of 5 stars which is a really good rating for exercise equipment. It’s a testimony to the fact people love what the Half-Fold can do for them. Quality shines through with the Half Fold, and that’s why Cellerciser is able to offer it at around $360-370 and customers are happy with the purchase because it’s built to last and built to help and not hurt your body. Amazon is a great place to purchase it because of their A to Z Guarantee for buyer purchases which means they want to make you happy with your purchase. As of right now, shipping is free.